No bowing but plenty of smiles. We analyse the body language of this afternoon’s historic handshake in Belfast. IT WAS A hugely symbolic moment in the long-running peace process in the North and for Anglo-Irish relations and a moment that will be recorded prominently in the history books. The North’s Deputy First Minister, Sinn Féin MLA and a former senior figure from the IRA, Martin McGuinness, today shook the hand of the British monarch Queen Elizabeth II, not once but twice. In the footage we did see of the second and final handshake, he is seen greeting her warmly and sending her away with good health and blessings – “Slán agus beannacht” he is reported to have said. There was much hype, must interest and much debate about just how it would all transpire. As if to quell what is likely to be anger among some republicans on the island, McGuinness told the media afterwards: “I’m still a Republican”. But what did the body language in the footage of the handshake we have seen say about what the pair were feeling? From the video we can see that while Peter Robinson, the North’s First Minister and DUP leader, and others bow their head as they shake the Queen’s hands McGuinness remains upright when he greets her. If you watch closely enough you can also see that at the moment the pair shake hands, McGuinness ever so slightly pulls Her Majesty’s hand towards him and of course they shake hands longer than any of the others did, perhaps both realising the symbolism of this moment. “The smiles look genuine although we only see them side on so can’t be 100 per cent accurate,” Phipps adds. 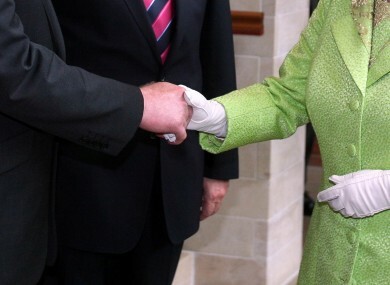 It also noticeable that the first thing McGuinness does after shaking the Queen’s hand is look towards the cameras. Making sure they got that perhaps? It is also interesting to note the interaction between McGuinness and the Duke of Edinburgh given that the IRA murdered Prince Philip’s uncle (and the Queen’s cousin) Lord Mountbatten in 1979 at the height of the Troubles. “Short and sweet”, Phipps says of that handshake. We can see from the video that just as he he did with the Queen, McGuinness remains upright, there is no bow. But unlike the light clasp with the Queen, this is a firmer handshake with the Prince. As well as the body language, it’s notable too that both the Queen and McGuinness were wearing green. The Queen was green in all but gloves and bag while McGuinness went with one of the 40 shades for a tie. “It spoke volumes,” remarked the BBC’s Ireland correspondent Mark Simpson. As Sinn Féin president Gerry Adams acknowledged last week, this was a “major challenge for Republicans” and off the back of the party’s refusal to attend any public events involving the Queen on her State visit to Ireland last year, it is considerable progress that this has happened just over a year later. As if to underline that progress, McGuinness will give a speech at Westminster in London tomorrow evening and on Saturday will appear on the Saturday Night Show with Miriam O’Callaghan whom he clashed with over his IRA membership during the presidential campaign last October. This was a politically canny move by Sinn Féin that will reach out to some voters but disappoint a small minority of republicans. But more important than all that perhaps it is a landmark moment in the peace process and one of the most significant events in the Queen’s 60-year reign. Email “'I'm still a Republican': The body language surrounding the historic handshake ”. Feedback on “'I'm still a Republican': The body language surrounding the historic handshake ”.